Derick Tait, chairman of Future Hawick, with welcome host administrator Marjorie McCreadie at the Common Haugh. Disruptive behaviour by boy-racers and their female counterparts is threatening to drive campervan visitors away from Hawick, a new report warns. Tourism in the town receives a huge boost every year thanks to campervans parking up and staying at the Common Haugh car park, particularly during the summer months. However, a report on Future Hawick’s welcome initiative this year reveals that the activities of nuisance drivers in the early hours of the morning are proving a real turn-off to visitors. 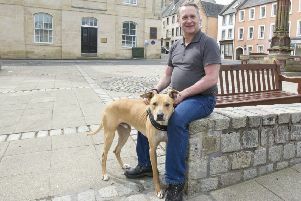 The motor menaces’ exploits resulted in several posts by holidaymakers warning others to avoid Hawick appearing on social media during the summer, Future Hawick chairman Derick Tait has revealed. Future Hawick was asked to take over the running of the welcome initiative last December to boost tourism in the town, but it says its efforts are being hampered by the illegal use of the Common Haugh as an informal racetrack. In his report on the 2018 summer season, Mr Tait reflects on a “successful, if somewhat hectic” first year. With the support of administrator Marjorie McCreadie, a fundraising campaign was launched to appoint the young hosts necessary to ensure the initiative was a success. A total of £4,270 was raised and grants were secured from the Hawick common good fund for £5,000, Scottish Enterprise for £1,500 and Hawick Community Council for £1,000, amongst others, enabling additional welcome hosts to be recruited. Statistics reveal that thousands of visitors from the UK, Europe and elsewhere across the world made tracks to Hawick this summer, with most of them said to have thoroughly enjoyed the experience. However, Mr Tait believes the issue with boy-racers and their female opposite numbers needs to be addressed as a matter of urgency if that positive momentum is to be kept up. He says: “Regrettably for our campervan visitors, there was an ongoing issue with boy/girl racers in the Common Haugh car park throughout the season. “On occasion, the disturbance caused from the late evening through to the early hours of the morning was quite considerable and resulted in several ‘avoid Hawick’ posts being displayed on social media. “The hosts reported incidents to the police on a regular basis, but little action was taken to deal with the problem. “The problem of boy/girl racers in the Common Haugh needs to be eradicated if we are to continue to attract campervan visitors. “The bad publicity on social media did not help the town as far as visitors were concerned. According to Future Hawick’s report on the summer season, the town attracted 353 campervans carrying 732 visitors between May and September, plus 34 coaches bringing 1,202 passengers with them.